Verse Rule: ABILITY: When you play this verse or another priesthood verse, you may draw a verse. There are many things that make Mormonism (The Church of Jesus Christ of Latter Day Saints) different from other religions, even unique among Christian sects. Many of them are cultural, some are political, others are doctrinal. One difference between us and other Christians that I feel is key is the priesthood authority that we claim. We believe that the early church organized by Jesus and the apostles fell into apostacy over the years. We believe that as the apostles, who were chosen and ordained by Jesus Himself, were killed or died, that priesthood was lost. We also believe that this priesthood was restored to Joseph Smith and others as a part of the overall restoration of the Gospel in the 1830’s and 1840’s. There are many revelations explaining the priesthood and documenting this restoration, but the best one to read is D&C 20. This week’s featured verse is all about receiving that priesthood. 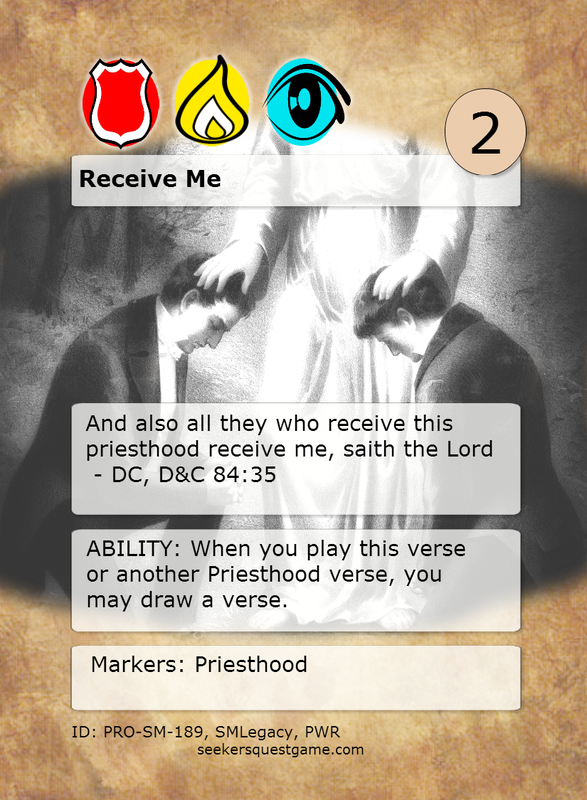 It allows you draw a verse everytime you play a verse with a priesthood marker. This verse doesn’t have a thematic marker. I thought it would be a little interesting to have a verse with just the priesthood marker, but to give it three different icons instead. Each time General Conference rolls around, I have a lot of fun on Twitter and Facebook! I love livetweeting what I'm hearing, and reading the thoughts that others post. You can kind of get a feeling for the zeitgeist of Mormondom based on the lines they tweet. Those are the quotes that hit people. So, I pick out some of the more commonly tweeted and retweeted lines, and I've started to make those into verse cards! Between last year's conferences and this year's, I'll soon have enough for a booster to make available. 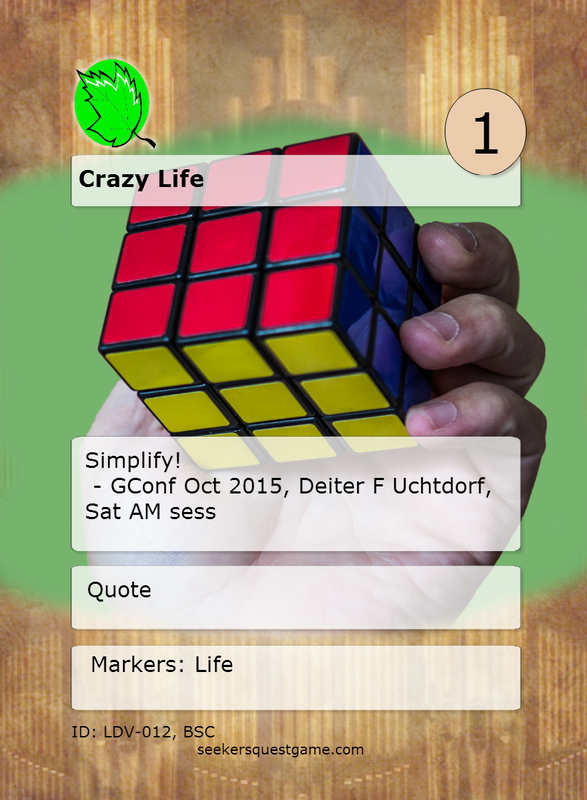 This one, named "Crazy Life" came from Pres Uchtdorf's Saturday talk about simplifying life. I grabbed that one word and decided that was the power of the verse. I'll make it simple, with the Quote mechanic! 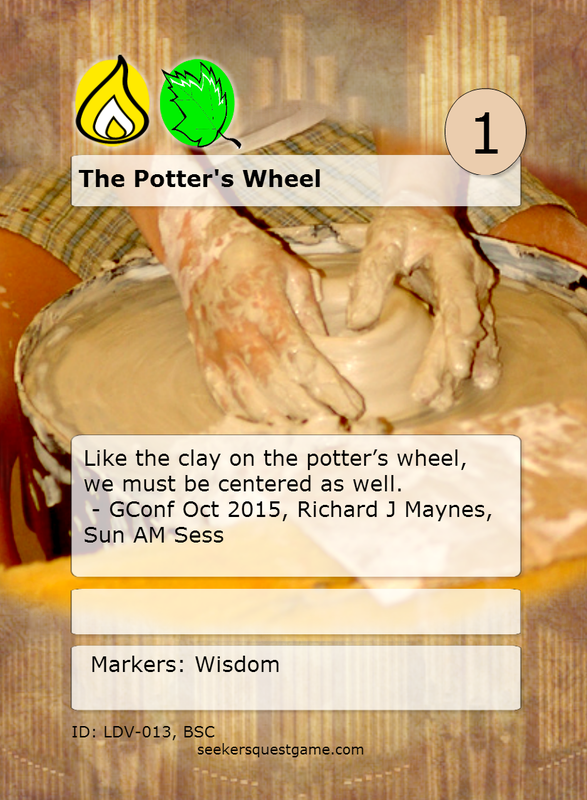 When Elder Maynes talked about the pottery class, and then the sister after him also mentioned the concept in some hymn lyrics, I knew that would make a great verse card. Especially since the potter's whee is such a cool visual. This quote was a nice gem of wisdom, so the icons were easy to choose. I didn't think this one needed any special rules. So, those will do instead of the regular featured card of the week, right?